I am getting this done! I think I have only missed posting on my regular schedule a couple of times. I wasn't about to miss it now! If you are reading this, I was successful! I rarely get alot of requests for all one thing in particular. I get a handful here and there, sometimes the same things, most times not. BUT. 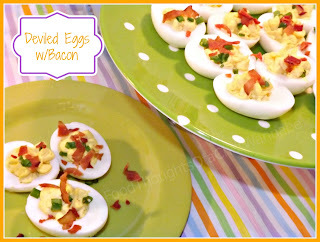 I have gotten so many requests for a basic deviled egg. I sort of thought it was a rule you had to make them like your mother or grandmother made them?! It isn't?! HA! My mom was a member of team paprika. I like paprika on top, just is nostalgic but I make mine a bit different these days. 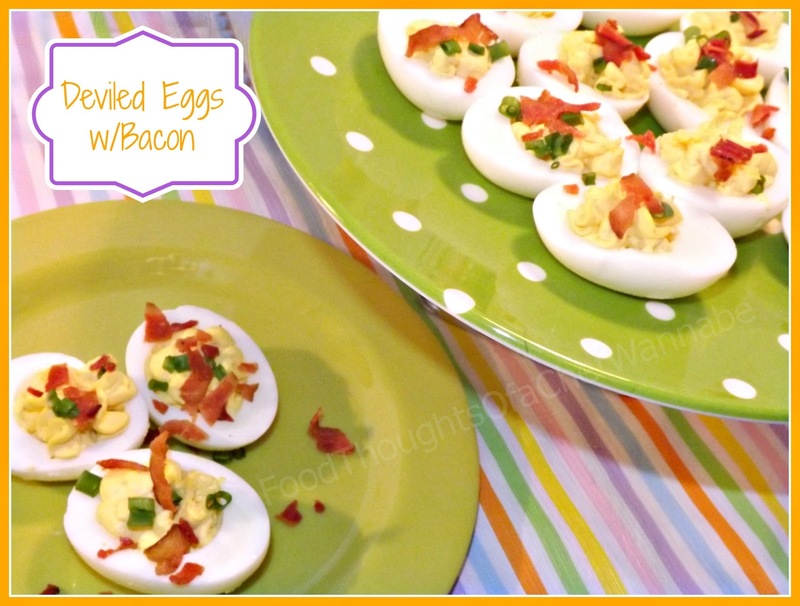 While these do have bacon on top, they are my basic deviled egg recipe. Deviled eggs are sometimes a source of contention. I have heard people make these so many different ways it is crazy! I love hearing and reading variations. Dill pickle relish, hot sauce, mustard, no mustard, mayo, salad dressing, topped with paprika, chives, I could go on and on. There are as many ways to make them as there are people!! Hard boiling your eggs in my opinion, is where a good deviled egg starts. Here is how I do it, and it has solved my lifelong inability to perfectly peel eggs. I will explain my method below. Perfection every time and no nasty green ring around your yolk! I wanted to share this with you before Easter, as it is a staple on many of your Easter tables!! Here is what you will need, leave off the toppings if you like, but trust me, these are DEFINITELY better with bacon! Place your eggs in a pot. Fill with cold water and bring to a boil. The SECOND it starts boiling, turn off the burner, and cover with a tight fitting lid. Set your time for 10 minutes, exactly. After 10 minutes, dump your water and run cold water over your eggs for a couple of minutes until the pan is cooled down. Keep the eggs covered in cold water until you are ready to peel them. They will peel perfecting and easily too!! Cut your eggs in half, and carefully remove the yolks. Most often you can just dump them right out. Put all of the yolks into a bowl and using a fork, mush them until they are fine crumbs. Add in mayo, mustard, salt and pepper, and mix until creamy. I use a piping back and a 1M tip to fill my eggs, you can just use a spoon as well, the choice is yours! When you have them all filled, crunch up your bacon and sprinkle over the top and sprinkle your finely chopped green onions over the top. I hope you enjoy these and let me know if you try them! Do you have a way different version?!? Leave it in the comments below so I can try some new versions!